I was in church last night around 6:45pm when the pastor announced that Steve Jobs had passed away; this was the first I was hearing of the news. I was hit with sadness for his family and friends and all the people who cared for him. It is being said in just about every media source that the world has lost a great leader, innovator, and visionary. His passion for technology and people has changed the way millions of people around the world live and do business. The innovations that were made possible by his hard work will not be forgotten. I simply wanted to take a moment to post something in honor of Steve Jobs and all the great things he accomplished. 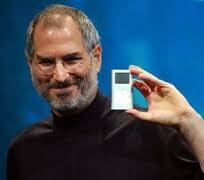 Here are some links from NPR, Apple, and PC Magazine for more information about his life and work.